all in one swipe-able board! What's the best part about using Trello to store bookmarks?? They're accessible from ANYWHERE. I don't use Safari much, for a few reasons, but especially while using many of my favorite business tools, and because of that my bookmarks aren't synced across my Apple devices. BUT, Trello has an app for desktop & mobile! So I can find my bookmarks via the app on my iPhone, iPad, laptop, desktop, or any other computer/device that can download the Trello app or access the internet. That is great news for me, because I have a TON of info in my Trello boards, that I need to access frequently. Next, lets dig into how to swipe my bookmarks board, and how to add it to your own board! 1) Don't want to start from scratch? Grab a copy of mine & add to it! Click here to get the link, and copy it to your own account. Get the link to my Bookmarks board (enter your email address in the signup page, and you'll get an email shortly after with the link inside!). While logged into your Trello account, click the rust-colored button in the email that says, "Grab the Trello board here >>" or right click and open the link (from my email) in a new tab in your browser. Where it says, "This board will be Private," click "Change"
Make sure "Keep Cards" is checked! otherwise the list titles will copy over, but not the cards/contents inside each list! Now you have everything from my board! Trello probably went ahead and opened that newly created board for you, so go ahead and personalize it; change the background, add your own stuff & delete what you don't want/need. Forgot how to delete a card? Open the card, then click "Share and more..." in the bottom of the right side menu. On the very bottom, there's a "Delete" button. Click that, and it will ask if you're sure, then click the red "Delete" button. If you're afraid to delete, just archive it. That makes it searchable if you ever need it later on, but it won't appear in your board anymore! Archiving is super easy, just press "C" on your keyboard, or click "Archive" in the side menu on the right of the card. If you don't already have a Trello account click here to create your own Free Trello account* or go to their website and create an account. If you click inside the grey box where it says "Create new board" you can start that quick process by giving the board a title, then click "Create Board." Trello kindly opens the newly created board for you immediately after creating it, so you can start working on it right away. Trello probably gave you default background photo, and to change that, you just go to "Show Menu" up near the top on the right, then click "Change Background." From there you can choose a solid color, or search for a free stock image to use. When you're done with that, click the "X" to get rid of the menu window, and go back to working on your board. Now this part is all you! Once the card is there, you can click on it and give it a description, a color label, members (subscribes them to changes you make to that card, but they have to be a Trello member like you! ), a due date, a checklist, or an attachment. 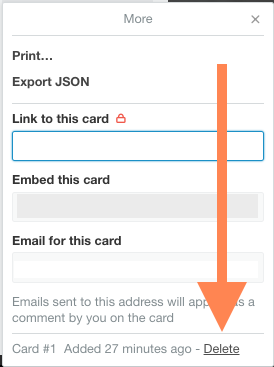 To attach a URL (link), just copy it from your browser, and paste it while you have that card window open. Or you can also click "Attachment" on the right side menu of the card, then paste it into the area underneath where it says "Attach a link" and after you paste it, you can give the link a name, so that you don't just see the URL there. Afterward, to click the link and go to that page, you just click inside the darker grey box that says "LINK" next to the attachment listing you want. To re-name the listing, just click right on top of where it says "Example" (or whatever title you gave it) and you can type a new name there. Hit Enter on your keyboard to save it. To get out of that card and move on to a new one, just click off of it, somewhere on the background around it, or click the "X" in the top right corner. If you need a refresh on Trello basics, check out my blog Organize Your Life with Trello here. If you're struggling to think of what to add right now, no sweat! Just keep the board around, and remember to use it next time you find a website page you want to bookmark. PRO TIP: Using the Chrome plugin for Trello will make bookmarking from your browser easier & quicker! 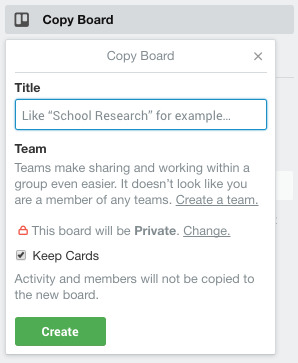 Once you've added the plugin, all you do is click the Trello icon, choose the board you want from the dropdown on the left, then choose the list from the dropdown on the right, give it a name, click the "Attach...." to attach the URL for that page, then click "Add." Done! Click the button below to sign up & swipe a copy of my Bookmarks Trello board (AKA: a gold-mine of resources)! After you sign up at that link, you'll get an email that will take you right to the board in your browser. I'm showing you all the places I go for inspiration on things like color, code, and free stock photos, including which tools I love and use myself. PLUS, I'm giving you links to places and people I trust for other information. That's it for today. Love this week's freebie? Tell me all about it in the comments below, or shoot me an email!